Imagine living without the internet, television, or electricity. It’s hard, right? My dad, Ed McCartan, grew up in such a place; A farm located miles away from the closest town, Lake Five, Wisconsin. He went to school in the classic one-room school house and graduated, the only one in his class. Although he is quick with a smile and a joke, it’s possible his shy manner came from this isolation. Somewhere along the line, he discovered art. He bought a motorcycle and commuted to Milwaukee to attend the Layton School of Art. Most people have nine to five jobs. But some who are lucky enough to have found their passion, never punch out. 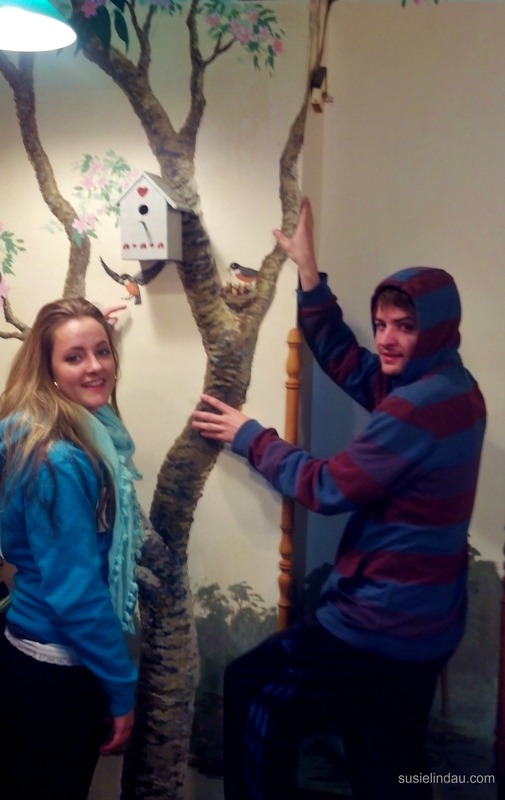 They use their creative outlet to express themselves during their free time too. My dad is one of those lucky people. He was one of the original Mad Men and worked in advertising for decades. Somehow, he never burned out. 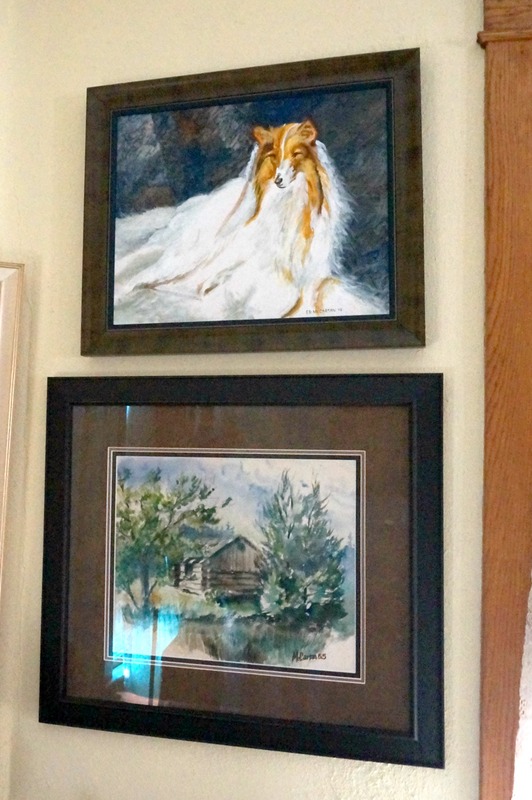 Instead, he sketched at night while we watched TV and then painted watercolors, oils and acrylics on the weekends. My sister, brother and I often drew alongside him. Crayons were our chosen media. There was something about a new box of crayons. The colors. The smell. Some of my fondest memories are of my dad painting on location during camping trips or while picnicking. All of his work has chronicled events from his life much like photographs. The difference? He captured the energy or the emotion of all of those memories in the use of color and expression on canvas or paper. My dad and I share a love of art. Many of you know I was a medical illustrator. When I found my passion in writing, I thought he may not relate. Instead, he listens intently when describing my ideas for books or screenplays. He still gives me advice and encouragement. After retiring, he and my mom settled into a routine. 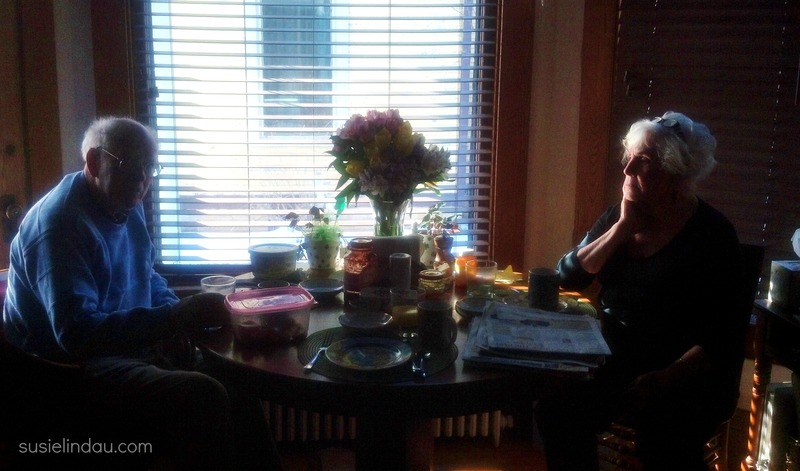 They would enjoy a leisurely breakfast which always included my mom’s homemade bread. Then he would draw at a table in their living room, only taking a short break to eat an apple for lunch. He would quit when one of my mom’s gourmet dinners was ready. 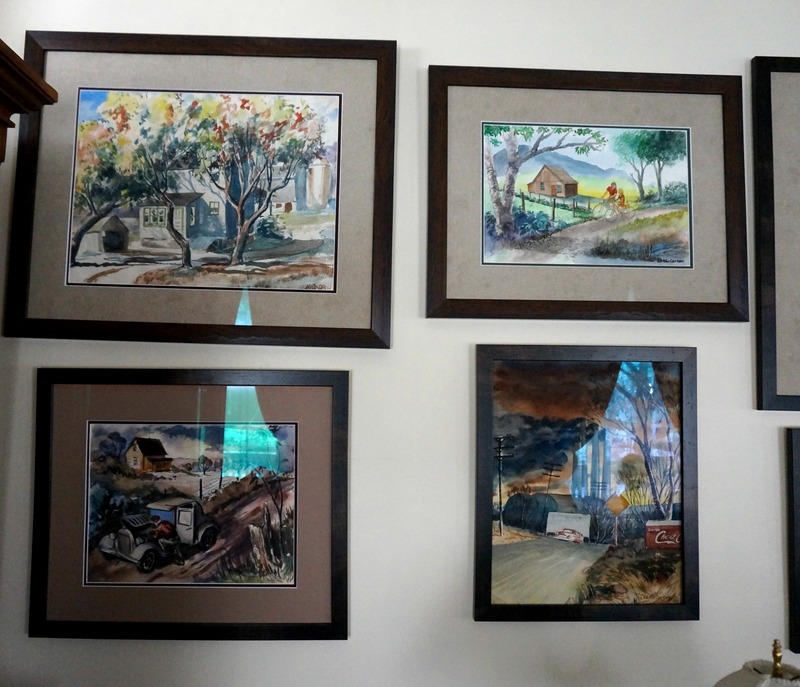 Last year, my mom had many of his pieces framed and hung. 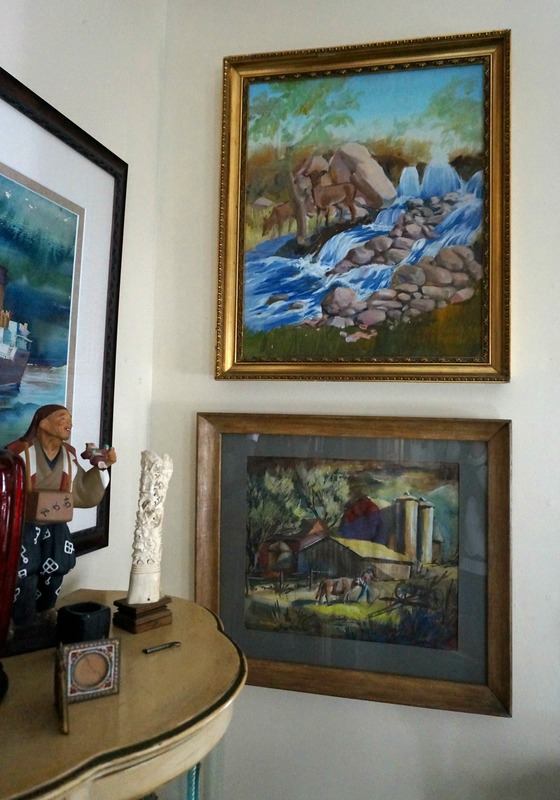 Their house soon resembled an art gallery. My reserved dad, loved it. He enjoyed pointing out certain paintings and would tell the story behind each one. My dad has never been a whiner, a complainer, or a crepe-hanger, a term my mom would use. He must have endured knee pain for years without telling anyone. This spring, he relocated to the nursing home. I worried he would be disoriented or depressed. It didn’t take long before he adapted to a similar schedule to the one he had at home, but with the added bonus of dinner for lunch complete with dessert. He’s all about dessert. 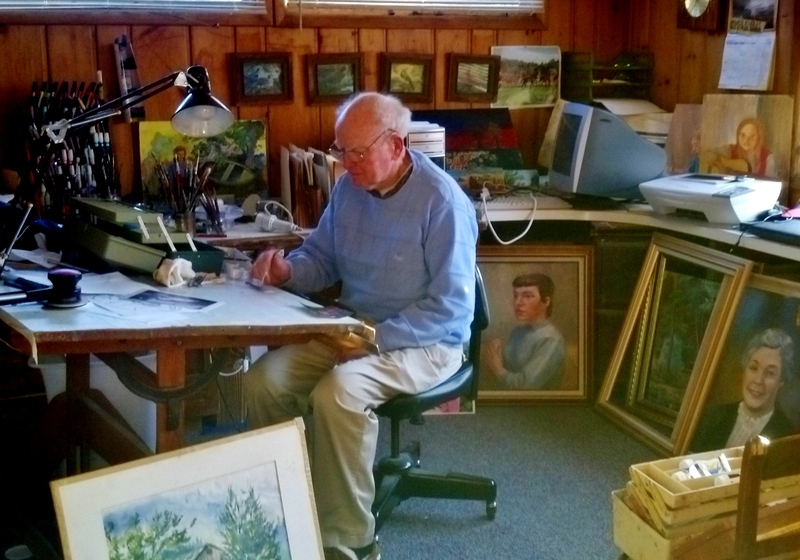 At eighty-nine years old, he still enjoys his passion. Instead of painting, he draws. Instead of creating art on location, he works from books, and photographs from his family Bible. My mom visits every day. She hasn’t been able to keep up with the volumes of work he has produced. 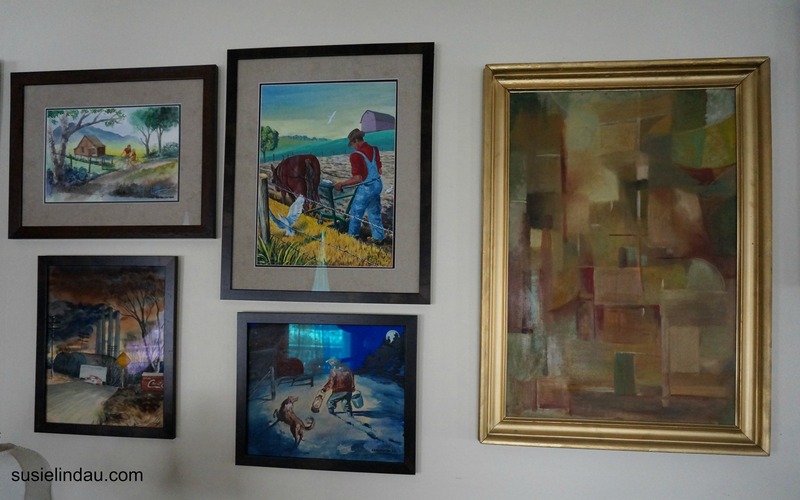 Instead of framing all of them, she plans to fill albums with his work. A lot has changed since those days on the farm. Now he is surrounded by many caretakers and people who love him. But his passion has remained a constant. 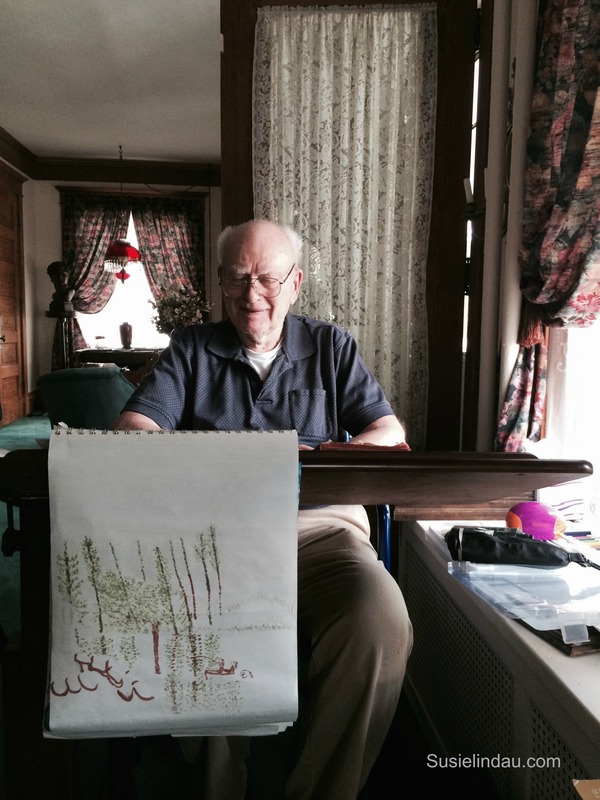 In July, hospice is planning his first retrospective art show. I’m not sure they’ll be able to rent enough easels. No matter. My dad will enjoy pointing out particular paintings to talk about. The next day he will return to his drawing board to create something new. Something that will express himself. He’ll spend his time drawing because it’s his passion. My dad passed in October 2015, but I’m thinking of him today! Do you have a passion or a hobby? What a magnificent Father’s Day gift. Your Dad sounds like a centered and fulfilled person as well as a gifted artist. I bet he’s really proud of you and your writing. The support from my parents is still so important to me. It was cool how he accepted my new passion. I would say that you hit it on the head. He is so centered and in the moment at all times that it does make for a fulfilling life. He’s never been one to worry about the future or dwell in the past. It’s a good lesson for all of us. I am always in awe of people who can draw and paint so well. I can’t even draw a straight line – even with a ruler I can get it wrong! I think everyone can produce some kind of art with a little practice, but my dad is extraordinarily talented. He still draws every day. Susie, this is so lovely. It’s now clear where your artistic talent comes from. Wish I could come to your dad’s art show and cheer him on. I love that sketch about the Pope’s book – it’s so touching and inspiring! He is so gifted. He really has an eye and could draw or paint subjects from memory. I could never do that. 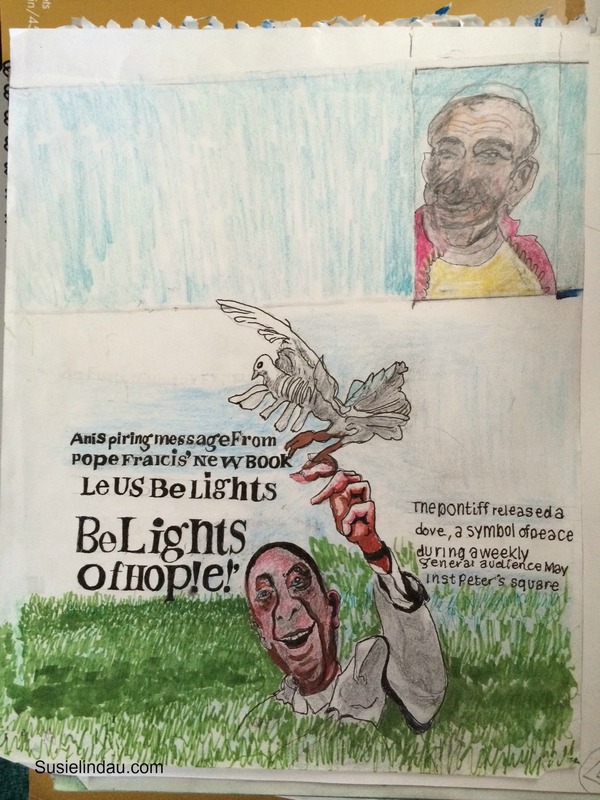 He drew every photo from his Bible and then drew the Pope. Now his drawings have become more skewed, abstract. They are really cool! I wish you could come too! That would be a hoot! What a cool story about your Dad! No wonder you have such awesome drawings, art runs in your blood! How funny I just saw a movie called Words&Pictures, with Clive Owen. Duuuude that’s you! You’re talented in both words and pictures. Movie is pretty cool too (Netflix) your Dad’s drawings are pretty amazing, I’d love to hear the story behind those paintings. So glad that even though he’s in a different environment, that his passion hasn’t fizzled out and that it gives home great joy. 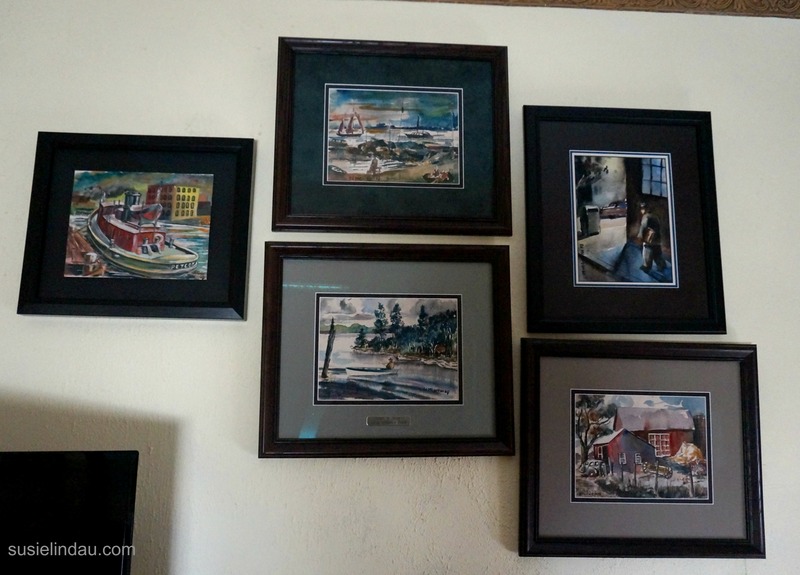 Very cool shots of all the framed art. Duuuuuude that’s so cool to have arts in the family, like music or singing or writing. Good luck to your sis on her artistic quest for a show. Thank you! 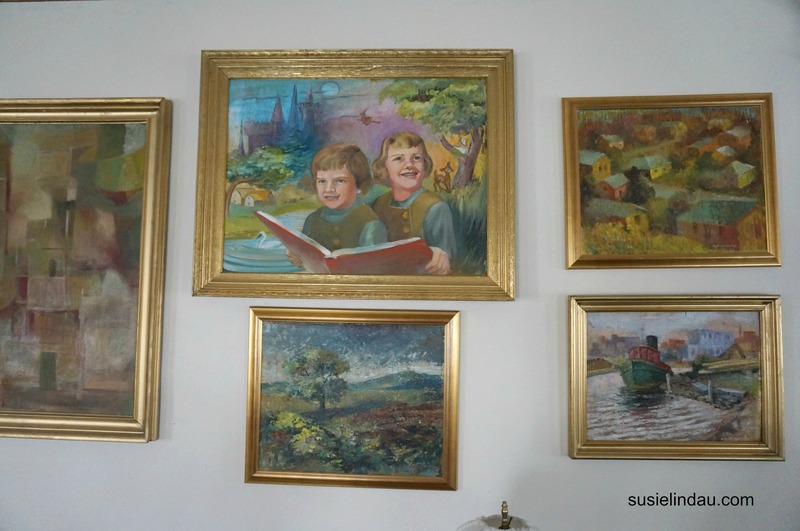 He has so many paintings and tons of drawings. I’ll have to take more photos the next time I visit. They say that if you find your passion, you’ll never work a day in your life. It sounds like your dad did just that. What a talented artist he is! Now I see where you get it, Susie! What a wonderful story. I love his art. It’s beautiful. Thanks Nicci! I missed your comment. 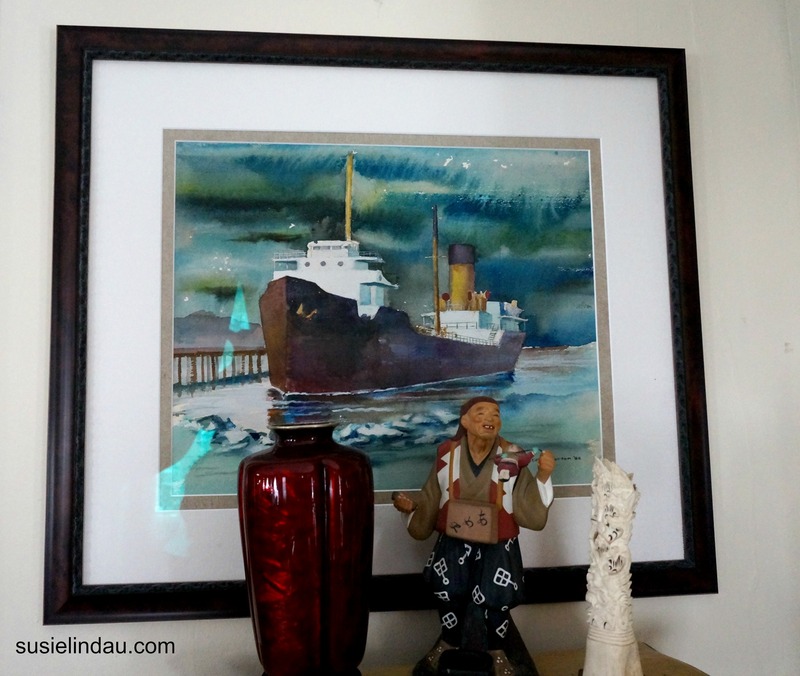 What an AMAZEBALLS post about Your AMAZING DAD – love the art and it is good to have a passion/hobby throughout one’s lifetime 🙂 I love reading, writing and taking photographs and hope to be doing it well into my 90’s. Thanks so much for sharing! Great to “see” you, Renee! Yep. He’s still at it. I will be attending his art show at the nursing home on the 18th. Pretty cool! I think it’s great that you have a passion you can enjoy for a lifetime too! I will! Thanks. It’s on the 18th.